Obama to voters: "Change has come to America"
CHICAGO, Illinois (CNN) -- Barack Obama did more than thump John McCain in the Electoral College tally; he also handily won the popular vote and redrew the great divide between red states and blue states. Barack Obama addresses a crowd of more than 200,000 at Grant Park in Chicago, Illinois. Riding a Democratic tide that bolstered the party's presence in both houses of Congress, Obama snared about 63 million votes to McCain's 55.8 million, according to totals early Wednesday. Early voting totals in the East suggested things would go traditionally, with McCain taking most of the Southeast, Obama most of the Northeast. As polls closed from East to West, Obama kept hammering McCain, as he snatched away Iowa, Colorado, New Mexico and Nevada -- states that had been in President Bush's column in 2004. And Wednesday morning, Obama added Indiana to the list of states he'd turned from red to blue. Indiana hadn't voted for a Democrat since Lyndon Johnson in 1964. When Indiana fell into Obama's column Wednesday morning, he had a 349-163 lead over his rival in electoral votes, with only 26 undecided. As he claimed victory Tuesday night, Obama told supporters, "change has come to America." "The road ahead will be long. Our climb will be steep. We may not get there in one year or even one term, but America -- I have never been more hopeful than I am tonight that we will get there. 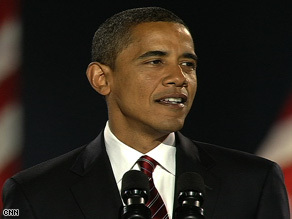 I promise you -- we as a people will get there," Obama said in Chicago before an estimated crowd of up to 240,000 people. With Obama's win, he becomes the first African-American to win the White House. "Today, I was a candidate for the highest office in the country I love so much, and tonight, I remain her servant," McCain said. The senator from Arizona called Obama to congratulate him, and Obama told him that he was eager to sit down and talk about how the two of them can work together. But Obama pledged to work across party lines and listen to the 46 percent of voters who chose McCain. "While the Democratic Party has won a great victory tonight, we do so with a measure of humility and determination to heal the divides that have held back our progress," Obama said. And he recited the words of Abraham Lincoln, the first Republican in White House, to call for unity. Supporters in Chicago cheering, "Yes, we can," were met with cries of "Yes, we did." Bush also called Obama to offer his congratulations. The president told Obama he was about to begin one of the great journeys of his life, and invited him to the White House as soon as it could be arranged, according to White House spokeswoman Dana Perino. More than 1,000 people gathered outside the White House, chanting "Obama, Obama!" "This was a long and hard fought campaign, but the result was well worth the wait. Together, under the leadership of President Barack Obama, Vice President Joe Biden and a Democratic Congress, we will chart a better course to build a new economy and rebuild our leadership in the world." Sen. Edward Kennedy said Americans "spoke loud and clear" in electing Obama. "They understood his vision of a fairer and more just America and embraced it. They heard his call for a new generation of Americans to participate in government and were inspired. They believed that change is possible and voted to be part of America's future," the Massachusetts Democrat said in a statement. Tuesday marked the end of the longest presidential campaign season in U.S. history -- 21 months. Obama, 47, will begin his transition to the White House. He will be sworn in as the 44th president on January 20.